Funny without being anything hilarious, this movie is enjoyable, but it also feels predictable and at times, a lot like something we’ve seen before. A pretty funny movie that just doesn’t make the grade as anything special the way that seth rogen movies usually do. perhaps it’s that this movie wasn’t written by rogen (unlike superbad, pineapple express, or this is the end.) the movie is pretty good in the first half, dealing with awkward and uncomfortable moments (the keep it down introduction scene, the cop showing up at rogen’s door), but in the second half when it becomes about the back and forth between the family and the fraternity, the jokes stop being so funny and the momentu gets a little lost. Neighbors is a pretty funny movie. It’s actually equivalent to some of actor Seth Rogen’s funnier films. No, this doesn’t reach the level of Superbad or This is the End, but it is certainly comparable to Pineapple Express. And the amazing thing is that with this one, Rogen didn’t write it. He’s written nearly everything he’s been in, even The Watch, which he did not act in, and which also turned out to be pretty funny. The man is a mastermind of comedy. Now it has to be this very specific slapstick-like type of comedy (Just look at Funny People, which went for something different and fell flat), but put him in the right genre and he seems to always hit it out of the park. To really qualify this movie, and where it falls on the spectrum, it helps to look at the director, Nicholas Stoller. Here’s a guy whose first movie was also his best. That film, Forgetting Sarah Marshal, made Jason Segal a household name. But after that, Stoller got worse and worse. First there was Get Him to the Greek, which was okay, but then he turned out the lousy film The Five Year Engagement, and suddenly the guy who made Sarah Marshal was all but gone. 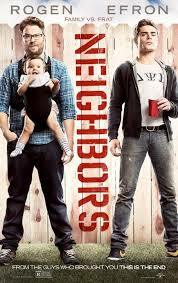 Luckily Neighbors is a huge improvement on Engagement. In fact, it is even a step up from Get Him to the Greek, which is a pretty decent film. In this one, Rogen plays the responsible guy who is now a parent having to deal with a fraternity that moves in next door to him. Rogen plays Mac, a guy who used to be just like these frat kids and still kind of wishes he was. He’s married to Kelly (Rose Byrne), who also has a sort of party edge to her. I really like that neither one of these characters was made to be a nerd or goody-goody. Rogen might not be playing the most irresponsible one in the film, but he is still playing a sort of version of himself. And Kelly could have easily been made into a nagging wife, but this movie steers clear of those usual clichés. It takes a while before we meet the fraternity boys and get into that situation, and that’s a good thing. Setup and development are important, and this movie knows that, taking its time to introduce us to the characters and their friends. The film opens with the married couple going at it with each other, having fun, until Mac realizes the baby is watching. He keeps stopping to spin her around. It’s funny, but also a scene that we’ve seen before in other films. That night, the couple gets a call from one of their single friends who is going to a concert. She just got two extra tickets and wants them to come. Mac and Kelly agree, thinking they can bring the baby along, and this is all to show that they still want to be young and cool and not let their baby restrict them from doing fun things. Only they never make it out the door. Both of them fall asleep while trying to get ready, and they end up just calling it a night, crawling into bed. The next day, we get introduced to the fraternity situation. Zach Efron plays teddy, the leader of the frat, and Mac and Kelly stand around their house, looking out their window, deciding how they will handle the situation. They plan to go over there and tell the boys that they will have to keep it down, and I love how these two take the time to practice exactly how they are going to say it. When they do go over there, the frat guys love them and love their baby, but the moment when Kelly tells them to keep it down couldn’t be more awkward. This whole part, from the two of them practicing it in their house, to the actual punch line of her saying it to the guys is all very funny. That night, the frat has a party and Mac and Kelly decide to go over there and tell them that the music is too loud. This turns into the two of them being invited in, joining the party, and Mac even doing mushrooms with the boys. Teddy gives him the tour around the place, and the two of them really seem to bond. At one point they sit on the couch outside discussing the different incarnations of batman over the past few decades and how different they are. They do impressions of Michael Keaton and Christian Bale as batman. This is a great scene, the kind that Rogen probably did have a hand in writing. But then things start to take a turn for the worst. Teddy makes Mac swear not to ever call the police if they are being too loud, and Mac does. Fair enough. But then the next night, the frat is being too loud, and wouldn’t you know it, Mac calls the police. He tries calling teddy first, but the call goes straight to voice mail. I guess Mac didn’t want to get up, out of bed, and go over there again, but when the only other alternative is calling the police, you get up and go over there. Either that or ignore the noise. Mac makes a very bad decision. This leads to the all out war that we know is coming. It starts with litter on the lawn and a bush that’s cut to look like a little boy bending over. The scene of Mac trying to move the bush off his lawn is not as funny as the movie thinks it is. In fact, this is where the jokes start to feel forced. In the first half, there was only one moment like that, where Mac and his friend were outside making references to smoking a joint that they thought their boss wouldn’t pick up on. That scene was stupid because they just kept going, making more and more references, as if they were trying to get caught. Here, first with the bush and then with a scene of the fraternity boys making casts of their members, things start to get more stupid than funny. The second half of this movie, where things really should be taken to the next level, ends up being the half that disappoints. All of the setup was great, including the scene where the cop came over Mac’s house and accused him of making the call about the frat. That scene ended with the cop telling Mac, “don’t ever call us again,” a very funny thing for a cop to say to someone. But the war between Mac and the frat, which really should have been the best part of the movie, ends up being the worst. There just aren’t many gags or jokes here that are funny. The best moment actually has nothing to do with a stunt, and is simply Dave Franco (playing Pete, Teddy’s number two guy), doing an impression of Robert De Niro in meet the parents. Now the second half isn’t terrible or anything, it’s just not on the same level as the first half. The stunts that the two groups pull on each other, like cutting the water pipes, or selling molds of their members, aren’t very entertaining. Despite this problem, movie overall is pretty good, but if the second half were a little better, it could have been something great.